PowPAC is pleased to announce our holiday fundraiser of Holiday Cabaret under the direction of San Diego Theatre and Cabaret legend Leigh Scarritt. This family-friendly Cabaret will feature holiday songs, stories, and dancing by San Diego Cabaret icons and PowPAC favorites along with Leigh Scarritt Productions youth performers. Join us before the show for holiday refreshments and a possible visit by Santa Claus himself. 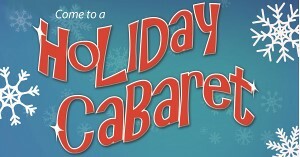 Take a break from the hustle and bustle of the holidays for a toe-tapping, spirit-lifting Cabaret!